If Pokémon Let’s Go is banking on my nostalgia, it’s working, but it’s also bringing to mind some disturbing questions about the nature of Pokémon. ’90s kids’ idle fantasies of weed-whacking our way through forests alongside some loyal, sweet Pokémon companion are realized in the latest Pokémon game, which even lets you pet and play with your Eevee or Pikachu. Seeing Pokémon out in the world and interacting with them as living, moving monsters, and not just bits of code, makes them feel more real. It’s easy to get attached. Though in Pokémon Let’s Go, most of the time, you probably shouldn’t. One thing has gnawed at me since I picked up the game last week. 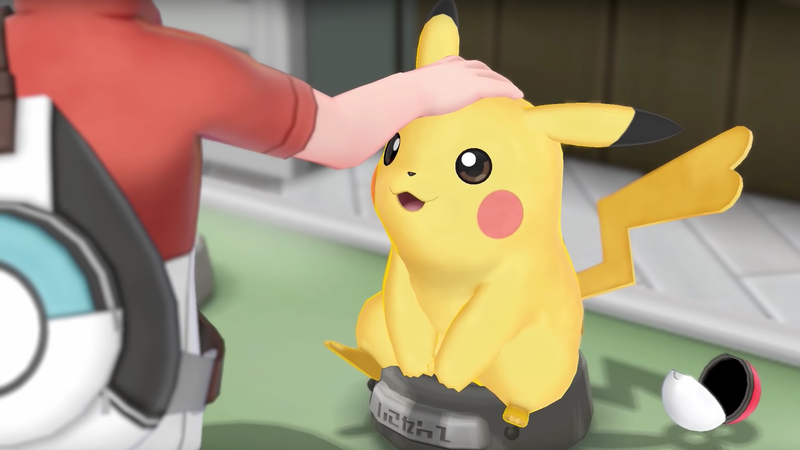 Pokémon Let’s Go is dedicated to currying players’ emotional attachment to their Pokémon. So, riddle me this: why does the game’s leveling system encourage me to trap, imprison and horde Pokémon in a dark box from which they will never, ever escape—unless I sent them to a professor who conducts tests on them and, probably, grinds them up into candy? I was trudging around the maze of Mt. Moon, Pokémon’s stony mountain zone, when I encountered my very first Geodude, a bulbous floating rock with arms. He threw himself up through the earth and landed right in front of me. All right, I thought. We’re gonna get along great. He’d be my guide through Mt. Moon and float alongside me as we delved deeper into the ground. I tossed a whopper at him. Easy catch. My PokeDex registered “Geodude” and then I filed him into my Pokémon Box, where I store all the Pokémon that aren’t in my small party. Since he was my first Geodude, and therefore my very favorite, I gave him a name: Oatmeal. (I am naming all of my Pokémon after baking ingredients.) I would dedicate myself to leveling up Oatmeal so, one day, he’ll evolve into a beastly Golem who would humiliate Lt. Surge at the third gym. Closing out the menus, I continued exploring Mt. Moon for a few brief seconds alongside Oatmeal until, lo and behold, another Geodude appeared. I already had Oatmeal. But in Pokémon Let’s Go, Oatmeal doesn’t just level up by fighting other monsters. Oatmeal levels up if I collect dozens more of his kind and stow them away into my tiny box. I ended up catching this new Geodude, and every other Geodude in my path. I’d clear the whole of Mt. Moon of Geodudes. But, unlike Oatmeal, they would never, ever smell the dank cave air of Mt. Moon or the breezy sea water of Fuschia City. Nope. Just gonna grab the little guys and stuff ‘em in my box. See ya, suckers! Once I grabbed enough Geodudes, I had two options: I could let them sit idly in my Pokémon Box for all eternity until, I guess, I die, or I can send them to the Professor, the objectively better option for leveling up my monsters. After selecting a dozen Geodudes to send to Professor Oak, he thanked me for giving him more specimens for his Pokémon studies. And, in exchange, he offered me some candy. That’s right—players can send Pokémon to Professor Oak, exactly the sort of euphemism you might tell your kid when their dog dies. Just like that lie, this too is darker than it sounds. If you thought that mass Pokémon incarceration felt a little iffy, consider the candy system. Pokémon Let’s Go’s “candy” is a spin on the mobile game Pokémon Go’s design. If you want a Pokémon Go Pidgey to evolve into a Pidgeotto, you’ll want to collect eleven more Pidgeys. Then what? Well, you grind them up into “Pidgey candy,” and feed them all to the original Pidgey. “Candy” is what levels up your Pokémon, and in Pokémon Go, it’s is more akin to Soylent Green than your typical power-up. The Pokémon in Pokémon Go are being forced to eat each other. It’s like feeding bacon to pigs to make them fatter and more delicious. Pokémon Let’s Go was always going to be divisive. It’s a deviation from a formula that has enchanted kids for decades, and over time, that formula has been able to produce some very dedicated nostalgia. I love Pokémon Let’s Go and am actually having a much better time with its leveling system than I have had previous games. Leveling up primarily through collecting rather than battling feels way less grindy. Yet it’s not so thought-consuming that I can’t watch The Great British Baking Show while I play (hence my saccharine naming system). The game is also incentivizing me to collect and store animals in some backpack mind-zoo where, presumably, they do nothing until I die or I destroy them. I’m not trying to ruin Pokémon Let’s Go for you or anything, but if you really think about it, you’re being asked to poach and imprison as many wild Pokémon as possible and then, probably, grind them up into candy that you feed to your best monsters. Or Pokémon is a cute kid’s game where you raise pets and have lots of friends.